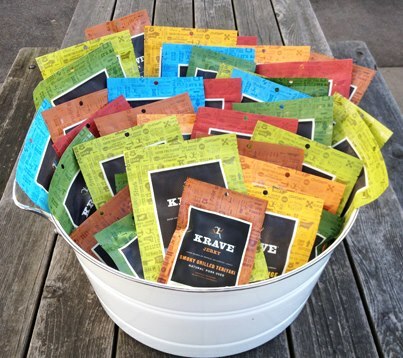 Haute Whimsy: KRAVE Jerky Giveaway! Just before the holidays, I had an opportunity to sample the most amazing jerky in the world! KRAVE jerky is as gourmet as snack food comes. With only 1.5 grams of fat per serving and more than 50% less sodium and cholesterol than other brands, it's absolutely perfect for the Whimsy Diet. From beef to pork to turkey, there's a little something for everyone. Scratch that - a LOT of something for everyone! They have such a wonderful array of flavor offerings that there was an air of madness to my sampling as I pulled piece after piece from bag after bag. I was nice. I was generous. I shared. It hurt, but I shared the jerky with my friends and family. My brother said that it was incredible and promptly snatched a bag of Basil Citrus jerky before hurrying from the kitchen. My mom was a purist and went for the Teriyaki. I can respect that, but I was all about the Chili Lime. As more and more of us found our favorites, the bags dwindled until we were left with a craving - er, I must mean KRAVING - for more. Thankfully, they have the KRAVE Klub which grants you 5 bags each month for just $30 - a must! Lucky for you guys, KRAVE is offering a 5 pack sampler to one Haute Whimsy reader (US residents only this time, please). My mouth is watering just thinking about this giveaway! For a chance to win a great helping of this delicious snack, please visit www.kravejerky.com and leave a comment below letting us know which flavor you're most excited about trying (mandatory). I like Krave on Facebook. Follow Krave on Pinterest (Danai). I follow Krave on Twitter. I would like to try the Sweet Chipotle flavor. I like Krave on Pinterest. I like Haute Whimsy on Pinterest. I want to try the Sweet Chipotle first! :-) Thank you. I follow KRAVE on Pinterest as sottovocerocks. I follow Haute Whimsy on Pinterest as sottovocerocks. I would love to try the Smoky Chipotle. the sweet honey chipotle is my pick! I want to try the Lemon Garlic! The flavor "I' would most like to try is Pineapple Orange, but truly as much as I would enjoy that, what would be even more exciting is to win this as a surprise for my awesome soulmate/bff love of my life hard working husband Todd who loves jerky and has NEVER had gourmet flavors of jerky. I honestly think he would crazy love ALL the flavors but if I have to narrow it down I think especially the Garlic Chili Pepper or the Sweet Chipotle. I follow Haute Whimsy thru RSS Feed subscription. I'd like to try the Pineapple Orange. I would like to try the Garlic Chili Pepper Gourmet Beef Jerky. I can't decide! SMOKY GRILLED TERIYAKI or PINEAPPLE ORANGE! i'd love to try chili lime! Honestly, I have NEVER had jerky! I know, crazy, right? So I'd love my first jerky experience to be a GREAT one. The lemon garlic and basil citrus turkey jerkies sound amazing to me!! I want to try the Pinapple orange. Follow Haute Whimsy on Pinterest. Follow Haute Whimsy on Facebook. I want to try sweet honey chipotle! Oh my goodness.. that looks and sounds delicious! I super want to try the Lemon Garlic! I would love to try the sweet chipotle flavor of jerky. The Sweet Chipotle sounds and looks yummy!!! The Sweet Chipotle sounds delicious! The SMOKY GRILLED TERIYAKI looks sooooo amazing!!! PINEAPPLE ORANGE GOURMET BEEF JERKY, OMG sounds sooo GOOD!! i would love to try the garlic chili pepper!